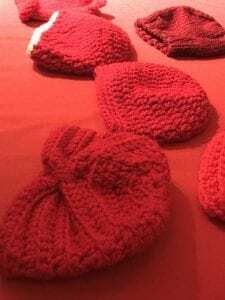 Hundreds of little red hats will soon be distributed to newborns at St. Peter’s Hospital as part of the American Heart Association (AHA) of New York State’s “Little Hats, Big Hearts” campaign. 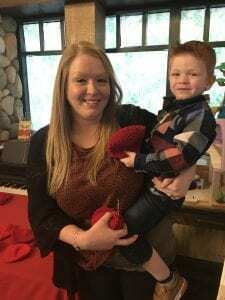 Amanda Engels, RN, a labor and delivery nurse, accepted the handmade hats on behalf of St. Peter’s, following a news conference Tuesday morning in Albany. The hats will be distributed to babies born during the month of February in celebration of American Heart Month. The “Little Hats, Big Hearts” program aims to raise awareness about congenital heart defects. At least eight of every 1,000 infants born each year have a heart defect, according to the AHA. 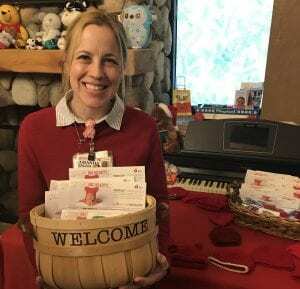 All of the donated hats were knit or crocheted by more than three dozen volunteers, including Lauren Peetz, RN, also a labor and delivery nurse at St. Peter’s Hospital. Peetz crocheted several hats for the program this year. St. Peter’s Hospital is proud to participate in “Little Hats, Big Hearts,” distribute hats to newborns, and help raise awareness about heart disease and congenital heart defects.